You are currently browsing the tag archive for the ‘Aracuan Bird’ tag. 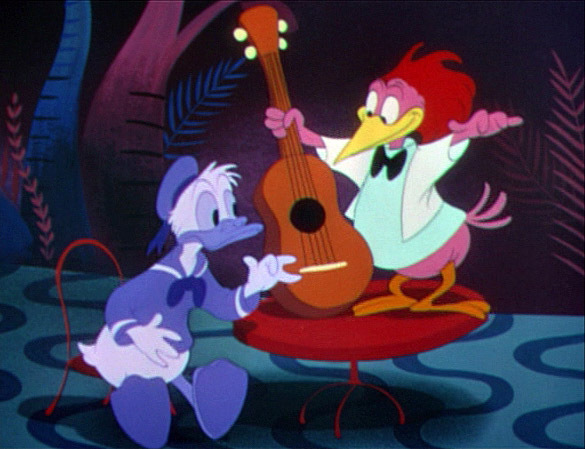 ‘Clown of the Jungle’ reintroduces the Aracuan bird from ‘The Three Caballeros‘ (1944), now hindering Donald’s attempts to photograph birds. The Aracuan bird is a surreal character, defying all laws of nature. For example, it can cycle in mid-air, duplicate itself and draw a door on a rock, and enter it. These abilities are very rare for a Disney character, and there’s no doubt that the Aracuan bird was inspired by the more absurd humor from the Warner Bros. and Tex Avery’s MGM cartoons. Director Jack Hannah handles this type of humor remarkably well, delivering the gags in a fast pace and with an excellent timing, making ‘Clown of the Jungle’ not only the most surreal, but also one of the wildest and funniest Disney cartoons from the postwar era. 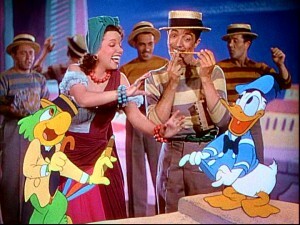 Being such a wonderful character, The Aracuan bird would return once more the following year, in the sequence ‘Blame it on the Samba‘ from ‘Melody Time‘ (1948). Unfortunately, the character remained alone in its zaniness within the Disney canon, and other Disney postwar cartoons remained much more conventional. 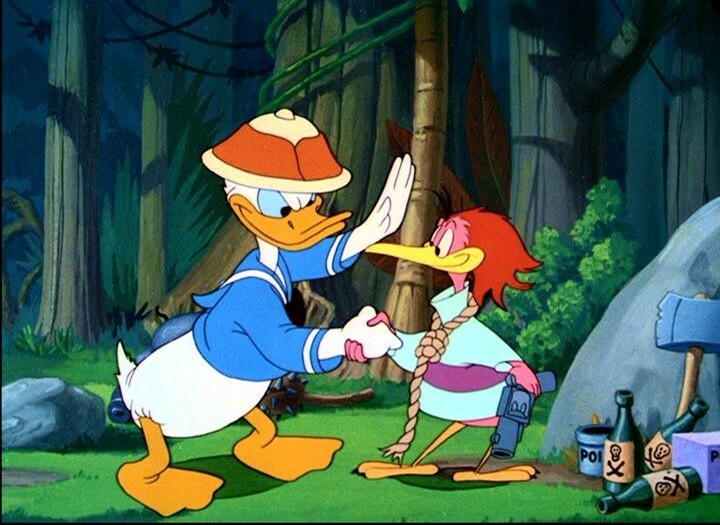 The short, the sixth segment from ‘Melody Time‘, reunites Donald Duck, Joe Carioca and the Aracuan bird. The latter serves as the cartoon’s surreal character, who can cross the three dimensions, not unlike the Do-Do in ‘Porky in Wacky Land’ (1938). It’s this feature that makes ‘Blame It On The Samba’ so enjoyable. Again, the Mary Blair-inspired backgrounds are highly stylized, even almost abstract, and extremely colorful. It also features some live action footage of Ethel Smith dancing and playing the organ and a pair of conga’s. Unfortunately, the music seems to be more about samba than being it, and it never becomes really hot. Nevertheless, ‘Blame It On The Samba’ is a welcome diversion after Melody Time’s three tiresome episodes ‘The Legend of Johnny Appleseed‘, ‘Little Toot‘ and ‘Trees‘.